The most important benefit is quality. This method is the closest you can get to the dent never happening in the first place. With PDR, the original manufacturers finish remains intact. There is no painting involved, no need for body fillers and no need to worry about color-mismatching or risk of overspray on other vehicle areas. Most dents can be repaired onsite at your home or business and in less than one hour. Most importantly the vehicles’ resale value is maintained. Cost is also a major benefit of Paintless Dent Repair. 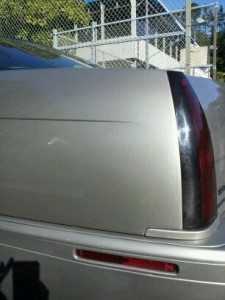 What Can I Expect To Pay For Paintless Dent Repair? It depends on the size and location of the dent and accessibility. The average dent, like one made by a golf ball, will cost approximately $150 to repair and can be completed in less than one hour. Successive dents on the same vehicle can be performed at a reduced rate. Whatever the damage, PDR consistently costs about 1/3 as much as traditional body shop repairs. Like anything, you get what you pay for. Using an experienced, professional dent removal specialist minimizes the chances of paint cracking. 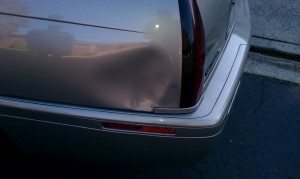 Usually the sharper the dent at the center of the damage, the greater risk of paint cracking resulting from removal of the dent. Dent Erasers technicians will give a thorough inspection of the damage and will inform you of the probability and risks of lifting the dent prior to any work being performed. Remember, Dent Erasers technicians use the most up-to-date methods and techniques to get the perfect finish. 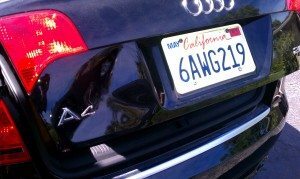 Many dents also come with scratches normally when the cause of the damage is from another car or a static object such as a post. Depending on the damaged area, we are able to remove scratches with our machine polishers and our special polish formulas. If the scratches are major, we will refer you to our trusted mobile paint technician to complete the repair. What If There Is Paint Damage? 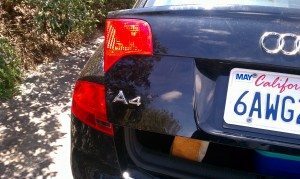 Occasionally, Dent Erasers encounters a vehicle needing paintless dent repair work that is just too extensive and needs an auto body repair shop. In this case, our technicians will push the large part of the dent out, saving you money on replacement parts, and refer you to one of our trusted partners to fill in and paint the rest. This is NOT recommended! There are many products on the market that proclaim to fix annoying dents to your car. Suckerpad applications from local auto supply retailers are the do-it-yourself alternative to getting your car fixed instead of using a professional dent removal specialist. These suckerpad applications fix around the dent and employ a vacuum pressure to lift the dent to its normal position. This NEVER works! The danger in doing this is the force used can warp the metal and crack the paint leaving your car in a worse condition than when you started. This can end up costing you more to have a dent pro fix the new damage as well as the original damage. Most professionals will tell you that these options in the long run are not a cheap alternative at all. A professional dent removal specialist uses a collection of precision tools to get a clean and successful finish. As opposed to some home made tools and suction devices on the market, dent specialists require a number of different tools to get the right hold on the bodywork and apply the right kind of pressures to the achieve the right results. No. There is currently no certification for Paintless Dent Repair that really has ANY weight to it. Do insurance companies acknowledge a “Certification”? No. Do dealers, body shops, or individuals know of or use a certified PDR Technician? No. Dent Erasers has earned the trust and respect of customers, dealerships, body shops and insurance companies by providing expert Paintless Dent Repair, performed by the best trained technicians in the business.